It is official! The BlogPaws conference is sold-out! That means that 500 bloggers are packing and hurrying to get their things ready for traveling to Nashville this upcoming week. I am not an early packer…at all. The reason is that I like to pack one time and be done. If I pack early, I will inevitably have to get something out to use or wear. Then, I might forget to re-pack it. My packing will be done Monday night. I am packing the boys' stuff early. They have specially designed bandanas and their Mardi Gras accessories to be festive. I will also be packing PrideBites toys for the road to keep them entertained. I explained to them that there would be a lot of swag and there could be new toys or chews. Bentley and Pierre were thrilled at that news, but Bentley insists that we carry his Muddles the PrideBites Pig with us. 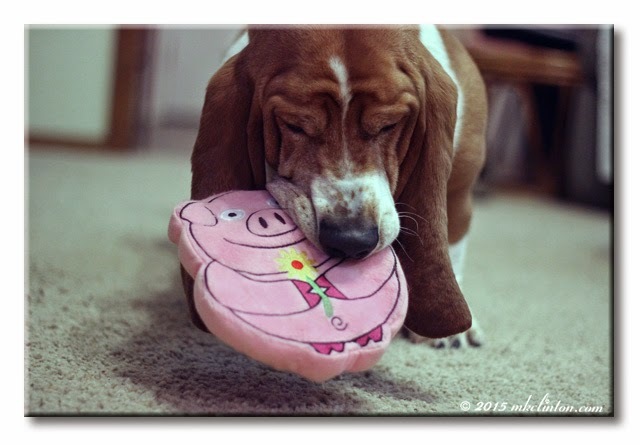 He loves his pig because it squeaks, it floats, and we can play with it outside. When Muddles gets dirty and pigs DO like getting dirty, I can just throw it in the washer. All of the PrideBites line of toys are cute, durable, and machine washable. Muddles and many other designs are only $9.99! You can use my PAWtner code: MKCLINTON to save 20% off of that price. what a fabulous item to take with, sold out, congrats have a great time. We probably won't bring any toys. I don't play with toys and Bunny never leaves home as he is too precious to risk losing somewhere. Bailie may bring a squeakie toy or two for the room, but we just focus on the swag coming our way and we know we will be too tired to play with anything anyway! There's gonna be lots of swag and cool stuff for you to play with at BlogPaws, Bentley! Have fun!! My husband said we definitely can go to the conference next year! Aww what a cute toy! Love it!